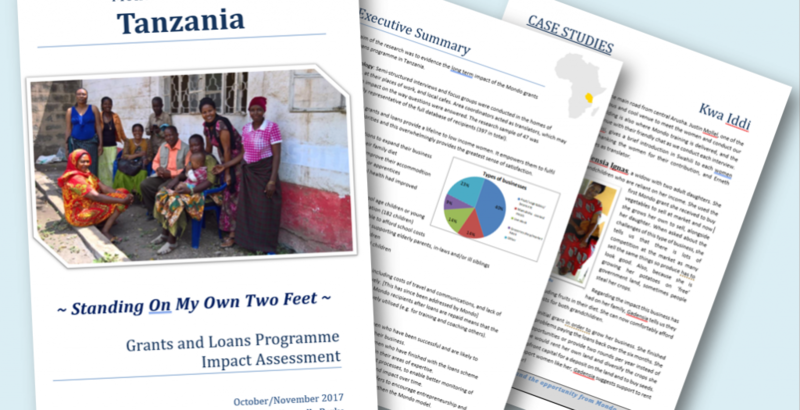 At the end of 2017, experienced social researcher, Sherrelle Parke volunteered to travel to Tanzania (at her own expense) and undertake a 3 week impact assessment of Mondo’s Grants and Loans Programme. Whilst she was in Tanzania, Sherrelle spent quality time conducting in-depth interviews with 47 recipients; visiting women in their homes, at local cafes and at their places of work in 10 locations across Moshi and Arusha, Northern Tanzania. 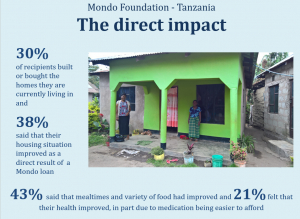 Mondo should continue with the successful grants and loans programme, as this is having substantial economic and social impact. Where there are plans to expand the programme to more women across larger geographical areas, more resources are required to sustain the supportive relationships vital to support recipients, and to deliver professional and efficient ground operations. 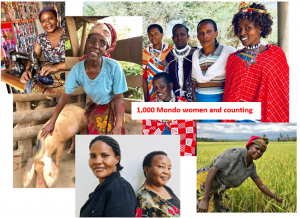 Mondo should consider investing in larger ‘Second Tier’ Loans – for women who have been successful and are likely to make substantial profit if supported to scale their business, especially if they have opportunities to employ other people within their business. 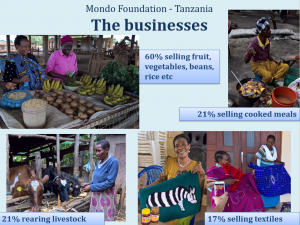 It would be good if the Local Mondo team could create ‘Mondo development events’ where the most successful business women, who have finished with the loans scheme, can continue to meet and share skills and advice in their areas of expertise. Mondo could also seek to invite external expertise, to inject innovative support into the group. 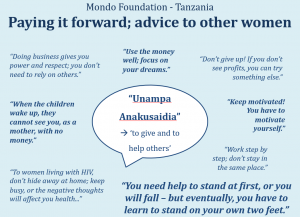 Mondo should provide broader practical support for Area Coordinators – there may be more robust and efficient ways of doing the vital groundwork, e.g. modern technological applications for managing back office paperwork and communications, and having development budgets to allow more frequent team meetings and ad hoc training events for old and new recipients. Mondo should continue to professionalise data capture and data management processes, to enable more efficient analysis of scale and impact over time. Keeping handwritten paper records is risk to Mondo operations and the data protection of Mondo recipients. Providing secure access computers or laptops would make the roles of Area Coordinators much easier, and protect the organisation and its database in the long run if roles change. Mondo should continue to invest in education. 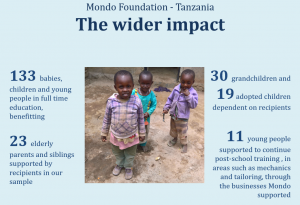 The schools Mondo supports could be used to deliver business courses for older children, preparing them for apprenticeships and vocational training. Enhanced training offers to encourage business leadership amongst young adults could strengthen the Mondo model – and create trainers and instructors to support recipients.